In March of 1964, an earthquake struck Anchorage, Alaska, shaking the city and the surrounding region for four-and-a-half minutes. The quake registered 9.2 on the Richter scale, making it then, and to date, the largest earthquake ever recorded in North America. Incorporated just forty years earlier, Anchorage was then still a young city. The modest population of 45,000 primarily supported the rail and air transportation industries, Cold War-era military installations and natural resource exploration. Alaska was also a young state, having joined the union five years before, nearly a century after the territory had been purchased from Russia. The earthquake, which collapsed several buildings including the airport control tower, burst a bubble of optimism that had been growing in Anchorage since the city's founding. Alaska's landscape was dotted with the remains of busted boomtowns, and the city's residents and planners alike had only gained enough faith to start paving roads and laying permanent concrete foundations during the preceding decade. After the earthquake, there was some fear the city might be the next abandoned boomtown if the location proved too unstable during seismic events. Bucking the trend, and showing faith in the permanence of the shaken and demoralized city, local businessman Walter J. Hickel Sr built a ten story high rise hotel at the corner of 4th Avenue and I Street, near the site of one of the bluff landslides, first opening to guests in 1965. The Hotel Captain Cook was named for Captain James Cook, who was the first westerner to survey the area during the explorer’s third and final voyage to the Pacific from Great Britain. The hotel quickly became a favorite among city residents for its restaurants, including the Crow’s Nest, on the tenth floor with commanding views of Cook Inlet. The hotel was also popular with flight crews and passengers alike from the international airlines stopping over in Anchorage en route to Asia in those days when Russian airspace was closed to the West. Expansion came quickly, with the 15 story Tower II completed in 1972, and 18 story Tower III added in 1978. The Crow’s Nest has sat atop Tower III since its completion, where Chef Reuben Gerber turns out New American cuisine with a focus on fresh, sustainable Alaskan ingredients in a fine dining atmosphere that has earned the restaurant the AAA Four Diamond Rating since 1999. The tenth-floor space in the original Tower I has been redubbed the Quarter Deck and retains the restaurant’s original bar. With the exterior painted in rich browns, the entire complex is designed to recall the rich teak woods of a British sailing ship of Cook’s era. Heavy, high ceilinged glass doors with carved wooden handles lead to interior public spaces with rockwork and teak paneling that evokes the mystery of Cook’s voyages of discovery. Nautical touches are apparent throughout, from ribbed wood-and-copper ceilings and supports that suggest a ship’s hold. In Tower I, the elevator landings are floored with teak wood reclaimed from the decommissioned battleship USS Colorado. Throughout the main and lower level, arcades are murals depicting Captain Cook’s voyages in the Pacific, from contact with indigenous peoples in Hawai‘i, Alaska, and the Northwest, but also reproductions of some surviving sketches from those on the journey. The hotel’s art collection is so extensive that walking tours can be arranged via the concierge. In addition to the Crow’s Nest, Fletcher’s at the base of Tower III is a pub-inspired eatery with an imposing glass-backed bar offering cocktails and Italian cooking. Full breakfasts can be had in the Café, where the blackened halibut egg white omelet goes a long way to warm a cold morning. Lighter eaters will enjoy the grab-and-go and espresso in The Cubby, while those not taking in fancy cocktails at the Crow’s Nest Bar upstairs can enjoy a more casual atmosphere in The Whale’s Tail, with shared plates and a self-service wine bar. Guest room amenities are standard for an upper upscale hotel, although in-room coffee from local brewer Kaladi Brothers is a notable touch. Amenities and services are also consistent with the exacting standards of Preferred Hotels & Resorts, the global luxury hotel collection of which the hotel is a longtime member. There's still a formal sensibility at the hotel, with liveried door and bell staff and at least one lightbulb bedecked entry awning straight out of 1970s Broadway. 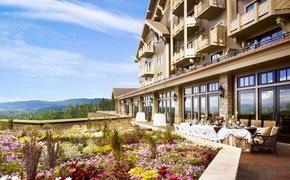 Stories told throughout the hotel tend to alternate between Alaskan tall tale and English pastoral. During Christmas, the hotel's pastry chef Joe Hickel famously creates a gingerbread village for the lobby, which has been a local visitor draw for decades, while the menu's at Fletcher's fancifully tell an origin story of Fletcher Christian (of Bounty mutineer fame) discovering Italian recipes, handing them off to Captain Cook, who buried the "treasures" on the hotel's site. At the top of Tower II is the Captain’s Deck lounge, which is available to those booking Captain’s Deck accommodations, which are rooms and suites on the secure sixteenth and seventeenth floors. The Captain’s Deck lounge serves up a full hot breakfast, offers refreshments throughout the day and a cocktail and appetizer hour reception in the evenings. The Captain’s Desk is also available to those bookings Crow’s Nest Suites, atop Tower III where one-and two bedroom suites decorated personally by the Hickel family after a succession of antique buying trips throughout the Pacific Rim. Captain’s Deck and Crow’s Nest suites are on a secure access floor, and have been occupied by celebrities and heads of state. The largest suite was occupied by the Prince and Princess of Wales in 1985 during a stopover en route to the Far East. As was customary for visiting dignitaries, the hotel would obtain the national flag of that country to fly atop the flag poles on Tower II, visible from the Crow’s Nest Suites, during the visit. The Union Flag of the United Kingdom was first put into service for that royal visit, and has remained a fixture atop the hotel ever since in homage to the British heritage of the hotel’s namesake (the Union Flag is not flown when the flags of the United States and Alaska are flown at half-mast). Guests also have access to the Captain Cook Athletic Clubs on the lower level. Separate men’s and women’s clubs have sauna and steam, workout equipment and free weights and share an indoor swimming pool and whirlpool tub. A wealth of function space occupies the main and lower levels, and the main level has a noteworthy shopping arcade, offering Alaskan art, native crafts, sundries, cold weather and adventure apparel, formalwear and other fine shopping. In November of 2018, another earthquake hit the Anchorage Basin. While nowhere near as large as the 1964 quake, survivors who remember “the big one” always tend to make comparisons. The 2018 quake caused some roadway collapse and affected infrastructure, but the damage was limited, considering it hit a city that has grown significantly in the last half-century. Now with a population of a quarter million, and virtually no doubt of its long-term viability, the Hotel Captain Cook continues to stand as a proud symbol of Alaskan tenacity. 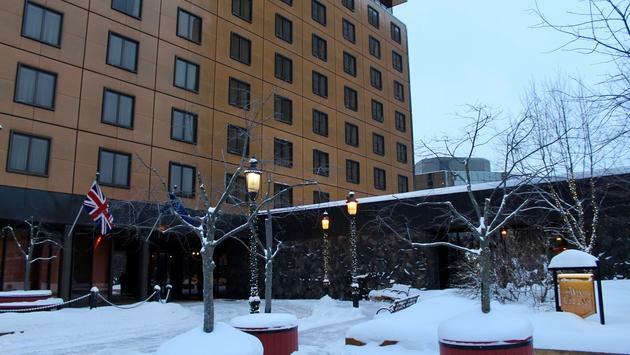 With a prime position in Downtown Anchorage, and a unique aesthetic one simply doesn’t find in hotels anymore, the Hotel Captain Cook is undoubtedly Anchorage’s most distinctive luxury hotel. Rates start at $165 during the winter off-season and are higher during the summer peak. The hotel’s almost eccentrically unique interiors are worth a shot, as are the views of Anchorage or Cook Inlet from virtually every guest room, The Captain’s Deck or the Crow’s Nest. The hotel offers valet parking at the 4th Avenue entrance for a fee, or paid self-parking in the adjacent Captain Cook parking garage. Turndown service is available upon request. Wally Hickel Jr, the hotel's president, is an honorary consul of Austria; the Austrian seal is proudly displayed at the concierge desk of the hotel.